Caroline Miller makes beautiful jewelry and copper items. I really liked the items with the plexi inserts and the text behind them. If I hadn't already bought a pendant at the Portobello show I think I would have splurged on one of these! I had a chance to chat with Heather who is the creative force behind Dahlhaus and admire her ceramics up close. They look even better in person than online! 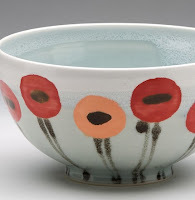 I especially love her signature poppy line which can be purchased online or in the new BC artist showcase store at Vancouver International Airport. Heather sells out of her stuff really quickly so if you see her and you are admiring her product, snap it up because it will be gone when you come back! I was absolutely intrigued by the pendants, rings and brooches from Erin Dolman "Under Glass" series. They are whimsical miniature tableaus done in precious metals. The craftsmanship and attention to detail is incredible! Lastly I had a chance to speak to artist Mark Atomos Pilon and besides being a very talented artist who has exhibited all over North America, he is a super nice guy who is a wealth of information about how to ship things across the world. Mark's work is influenced by the 50's and 60's and is described as "post-pop". I don't know what I would call it but it's very cool and well worth a look. I'm sure I missed something or someone but hopefully I have given you a taste of 2 great shows. Would love to hear any comments you have.